If you’re into shooting video with a DSLR camera, it’s likely that you have a dream of making a movie. Even if it’s just a short film, most people I know would love to have an entry running in the local film festival. And, from there, who knows how far you’ll go? But you have to get started. And Jason Brubaker has put together an awesome downloadable guide about the Modern Movie Making Movement. It’s free, just click on the link above to download the zip file. You’ll find articles from people who make movies on extremely small budgets and with hardly any crew. Not only have they’ve actually done it, they give you the real stuff about how it works and what it takes. Like everything in life, you have to start where you are. If you’re dreaming of making movies with a DSLR, then this book is the next step toward living your dream. 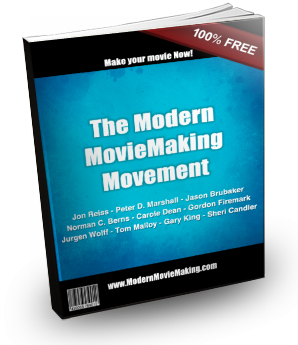 The Modern Movie Making Movement book has no cost, you don’t even have to sign up for an email list. Just click, download, and start moving forward on your dreams. To be fair, you need to know that Jason and all the other talented people who created this book have included links to their web sites and products. Yes, these are affiliate links and if you buy something they’ll make money. Even that is a great deal. I look at it this way. I want to be supported as a creative person, making a living from making movies. As they say, what goes around, comes around so I support other artists in their projects. Not only do you get great information and encouragement, you’re part of the exploding movement in modern movie making. I look forward to seeing your videos on the web. Thanks for posting this. We put a lot of of work into jamming the book with as much information as possible – So far, the responses have been great. I hope both you and your readers get tons of value from the content. I can tell, it’s a great effort and I know people will benefit from it. Thanks for all you do! Next post: FCP7 vs FCPX – Deathmatch!